Buy Varnishes for Sale here. Varnishes can be used indoors and outdoors, type vary. Some Varnishes have different useful qualities needed by hand painting Artist's. Some Varnishes are combined to create patterns when gilding. 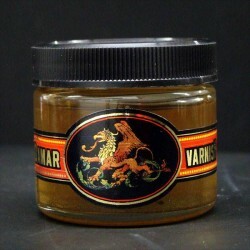 While other Varnish like Asphaltum works well as a resist for glue chipping or as a transparent shade on gold leaf for traditional signs and glass signs. Asphaltum Varnish, Glue Chip or Acid resist, Split Shading and mixing glaze. Bulletin Spar is great for high traffic areas signs and reverse glass signs. Damar Varnish for Faux Glass Embossing. Fast Gold Size Varnish, Gold Leaf Gilding Application Adhesive. Fibraseal Varnish for Japan Colors. Frog Juice Signs Urethane Clear Varnish. Quick Rubbing Varnish, short dry time touch-up gold size or mix with Damar. Slow Gold Size Varnish, Gold Leaf Gilding Application Adhesive. Window Spar Varnish is a www or white water varnish.